About 6 months have passed since my last post (yikes, where has the time gone?!)! I do apologize for so much of a lapse between posts, but as you’ll remember from my first blog, writing has never been one of my strong points. I’m writing today because I’ve recently taken a continuing education (CE) class whole (which has been on my “To Take” list for a few years) and it was so awesome, I just had to share it with all of you! The 3-day class was for Full Circle’s Spontaneous Muscle Release Technique (SMRT; read “smart”): Shoulder, Axilla (armpit), Ribcage, & Upper Back. SMRT as a whole is a positional release technique that focuses on prompting the client’s body to regain its natural balance. This technique is so gentle (only causing minimal discomfort on a couple of positions), but yet so effective at getting into the deeper layers of tissue without the therapist having to push their way through it using their strength (and causing discomfort in the client). It may not feel like much is being done but trust me, it is doing wonders and allows your therapist to access the deeper tissues. I had chosen to take this section of SMRT vs. others for a couple of reasons. Firstly, the majority of the clients I see have restriction and/or injury to these areas. The other reason is that I wanted to see/feel personally how well SMRT worked on older restrictions/injuries. 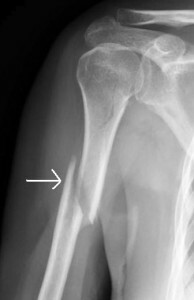 To explain: I spiral fractured my right humerus (upper arm bone) in a car accident about 10 years ago (see picture). The break had caused part of the Deltoid Tuberosity (DT; roughly where the arrow is) to break off and reattach itself,which created all kinds of scar tissue. Thankfully it healed properly on its own and they didn’t need to put a plate in (Whew! ), but I was in a hanging cast for 6 weeks. This caused quite a bit of range of motion (ROM) issues. Most of that went away after time, but I still had issues with raising my arm completely overhead… I could do it, but I had to force it to be completely straight. We had worked on the shoulder and axilla the first day. Even though it used much lighter pressure (which is completely opposite of what I’m used to using), I was able to get the hang of it right away. When it was my partners turn to work on me, I explained all of the issues I had going on in my shoulder due to the fracture. I really wish I had gotten a “before and after” picture because with all of the releases he was able to get in just my shoulder, I was able to raise my arm completely over my head with no effort and there was no discomfort or pain for me while he did it!! Some of the scar tissue near where the DT broke off had also gone down (Bonus!). With the axilla work, I was able to get some beautiful releases in one of the hard to get to muscles (subscapularis), which is also where I hold a lot of my stress/tension. An A-MA-ZING first day, right?? It passed my “personal test” with flying colors that first day… but wait, it gets better! On day 2 we worked on the entire ribcage (all 12 ribs and the collarbone), and day 3 we worked on the upper back. After the ribcage work (which was really neat to do), I noticed that I could breathe easier, take deeper breathes, hold my breath longer, and that night I slept like a rock. It had been the most restful sleep I had had in a very long time. After working on the ribs, we moved to the collarbone (which included the AC joint strain I mentioned in a previous blog, and yes it is the same arm/shoulder that I had broken 12 years ago). Having the shoulder work the previous day definitely helped this area out, but I still noticed some slight discomfort. As soon as my partner started the release for that joint, I had instant relief. The upper back work was just as amazing as the rest. The other area I hold stress/tension is in my upper back (upper/middle traps & underlying tissue) and after the work we did, the area was the most relaxed I can ever remember. So far, 3 weeks later, I am still able to raise my arm above my head without much effort, I’m still breathing and sleeping better than I had before, and I still don’t notice the AC strain any longer. I’ve been using a few SMRT moves in my sessions since finishing the class and so far my clients have had excellent results. I definitely plan on taking all of the courses for SMRT because of how effective, yet gentle it is. With this technique, we can steer away from the old “no pain, no gain” mentality; it doesn’t have to hurt in order to get results! If you ever have the chance to receive a massage from a therapist who is trained in SMRT, do it. Your body with thank you! If you’d like to learn more about this wonderful technique, feel free to contact me or you can check out Full Circle’s website or Facebook page.